Fun fact #1: Hong Kong has a serious mold problem. Never read about that in the guidebooks? Me neither. Fun fact #2: I’m all for security with all the things technology is allowing us to do, but sometimes it goes too far when you’re trying to make reasonable transactions in foreign countries. Read about the troubles and travails of the week. I hope you’re well. Sadly, this blog isn’t quite as exciting as previous ones – does anything ever really compare to practically free spas and vending machines with chicken feet for purchase? But never fear though! I’ll still find plenty of interesting happenings to share. I’ll start with the mold problem in Hong Kong. Yes, you heard me right: mold. Never read about that in the Frommer’s or Lonely Planet Asia guide books? Then you’re not truly reading from someone who lived in Southeast Asia for an extended period of time. Since Hong Kong was probably the wettest and continually dampest place on Earth next to the Amazon Rainforest, it made sense that there might be mold problem; funny enough, no one decided to mention this to the incoming exchange students. Ever. So imagine my and my friends’ surprise when our rooms, backpacks, luggage, shoes, and anything else you might care to think of started to grow mold (my friend even said her boyfriend’s computer and calculator were killed by the humidity the previous semester!). This became a serious problem very quickly. My roommate and I were relatively lucky; our room only had spots of mold growing on the ceiling, light, and wall. Other students didn’t get off so easy though; it seemed like every day I heard more and more cringe inducing tales of the mold; it truly became like the Blob; consuming anything it could: high heels, sandals, backpacks, anything. No one knew how to combat it either. We bought ineffective little dehumidifier boxes that were supposed to absorb moisture, but no one was sure if they worked, and what did you do when your ballet flats were already growing mold? Throw leather shoes into the washing machine? It was a little late at that point for preventative measures. Anyway, my quick thinking roommate informed our hall tutor of the mold and about a day later there was a note (in Chinese which neither of us could read, of course) in the room and the mold was miraculously gone! At least for the time being. Everyone was paranoid though and for a time, mold become the hot topic of conversation; swapping mold prevention methods over dinner and talking about what item was lost to the destroyer was commonplace. If you ever plan to stay in a more humid part of Asia for longer than a few months, you’ve been warned. Me and my love of street food. This cost me just $0.75 USD, by the way. After spending time in Asia, I became a huge, huge fan of basically any and all street food – corn dogs still won’t do it for me, but different kinds of meat or dumplings on a skewer are a favorite. 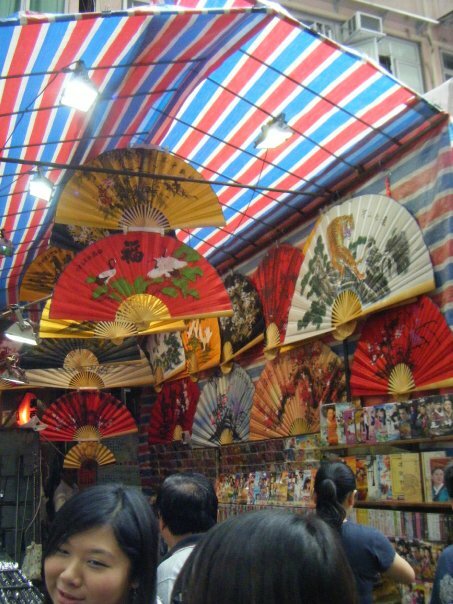 They offered everything from milk tea with tapioca bubbles to street waffles with fillings sandwiched between two halves to dumplings and more, usually on a stick (even ice cream!). Let’s just say, we had closer to two dinners a few evenings; or dinner and dessert if you care to look at it optimistically. On Thursday of that week, the fun really ramped. My friends and I had been debating about where to go for Spring Break, which fell over Easter in Hong Kong. It had come down to either Beijing and Shanghai in mainland China or Thailand, Laos, Cambodia, and Vietnam in the lower half of Southeast Asia. The only things holding up decisions, other than the heated discussions about where to go and making the most of our time there, were the airline tickets – everything was SUPER expensive from Hong Kong over the dates we were trying to get. There was a breakthrough on Tuesday night though. My friend Ilaria had the brilliant idea of looking on a popular flight website Ctrip.com, but using Shenzhen, China (just an hour’s train ride away) as our departure destination, and lo and behold, reasonable airline tickets to Beijing and Shanghai materialized like a magic! Alleluia, we now knew where we were going for spring break: China or bust, baby! 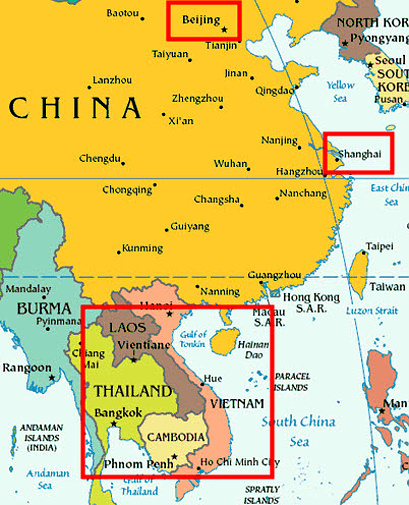 Our spring break dilemma: mainland China or Southeast Asia. So back to Thursday, after doing more research about taking an overnight train between Beijing and Shanghai so we could see both cities during the break, we were ready to book our tickets – or so we thought. We gathered together to order (everyone’s laptop was at the ready), selected the flights we wanted, proceeded to pay with our foreign credit cards, and went to dinner thoroughly pleased with ourselves. Fast forward two hours. As I calmly checked my e-mail to see if I had gotten my online confirmation, I received an e-mail saying that since my credit card was foreign the company needed a picture of my passport, a picture of my credit card, a signed Credit Card Payment Authorization form (which they provided online and wanted me to print, sign, then scan and fax – oh, and they wanted it all 30 minutes from now or else they would cancel the ticket orders completely. Have a lovely day.). WHAT!? I leapt into action; calling my girlfriends as I ripped my passport out of the lock box in my room to alert them to the impending hitch in our carefully laid plans. Two hours after that you would have seen me sitting in my room surrounded by scraps of paper that I photographed and uploaded to my computer to play the part of the “Payment Verification Form” (since I had no access to a printer or scanner at 9:30 PM), my digital camera, and my passport, completely stressed out after Skype-ing the company numerous times trying to clear up the fact that, yes, my credit card really was legit and I really was who I said I was. Of course by the time the company sent me an e-mail saying they received all the necessary documents, their order processor had already gone home for the day so I had to wait (and pray) another nerve-wracking 24 hours for the e-mails confirming my orders had been processed and my credit card actually charged. Such massive angst and drama! Friday dawned brighter though; the charges did indeed go through, and all four of us were officially on our way to Beijing and Shanghai for spring break! Success! 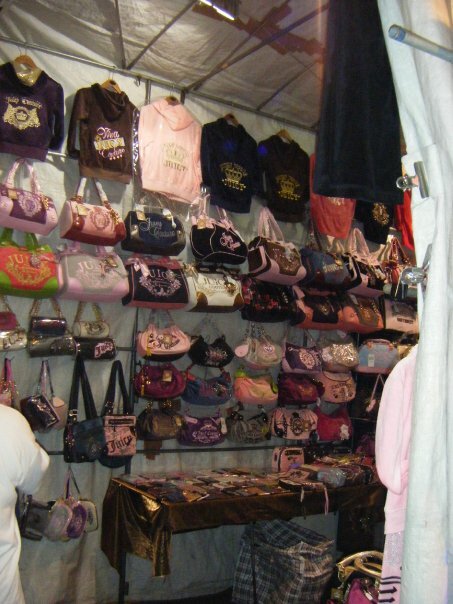 And that night, since the weather was so wonderful (about 75 degrees Fahrenheit), my girlfriends and I went to Temple Street Night Market, which is similar to Mong Kok Market in that you can barter and buy all kinds of touristy tchotchkys, pirated DVDs, fake designer handbags, and everything else you never knew you needed but still absolutely must have. We ate some superb seafood near Temple Street outside on the corner of a restaurant, and afterward wandered down the stall aisles as vendors yelled “Hello” to us when we so much as glanced in their direction. I didn’t buy anything. More practice was still needed haggling before I’d feel bold enough to actually buy something without feeling like I just got ripped off, but I got in some more practice while I was there. Towards the end of the evening, we bought bubble tea from another tea stand (there are approximately 568,342 different milk tea sellers in Hong Kong), saw a few more random stores (one had a neon cow next to the sign – I can’t imagine what that was for) and called it a night. Don’t miss my next post – when I really got a crash course in shopping like a local. Not an experience to be missed, for certain! 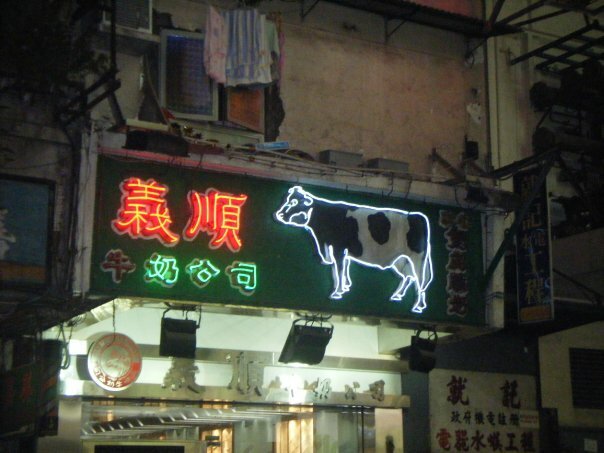 The aforementioned neon cow sign. Does anyone know what it says? 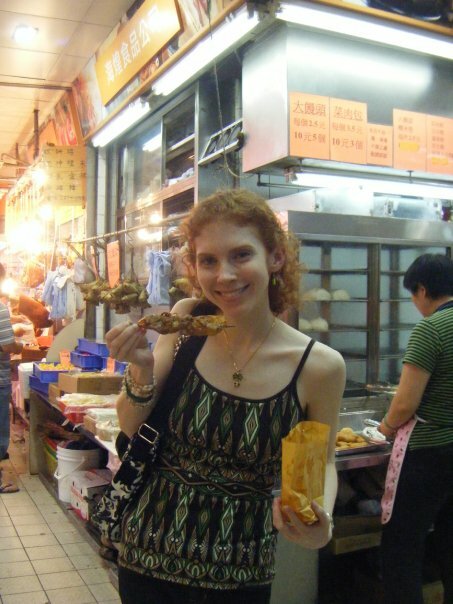 This entry was posted in Asia, Hong Kong and tagged Asia, Credit Card, Hong Kong, Mold, Mong Kok, Street Food, Travels on March 10, 2014 by Paige N..